1. In a large saucepan, season meat with salt, maggi and onions, then boil until tender. 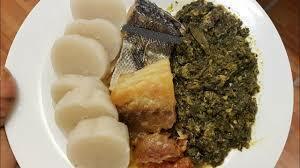 If using beef bones, cassava leaves can be put in once the broth is ready and then boiled for 30 minutes. If beef is used, remove beef from broth and pour in cassava leaves. 2. Then add the ground peanut, onga pondu, vedan, palm oil, blended mix, salt, pepper and cook for another 45 minutes. 3. The beef is only added right at the end once the cassava is properly cooked and cooked together for about 5 minutes. *** The recipe and directions are mere guides on how to prepare the dish. Ingredients and outcome may differ according to preference or preparation. *** Why wait, order your ingredients online now or visit our store.